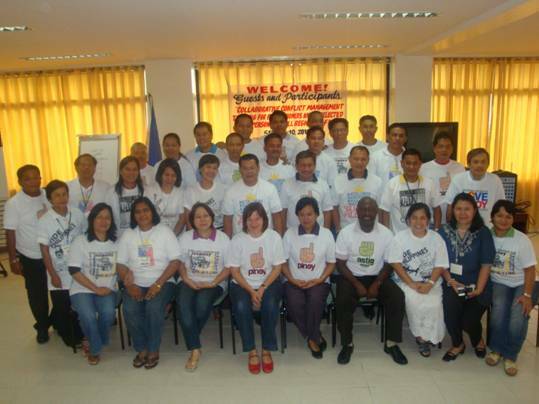 A 5-day training on collaborative conflict management for enhanced nfps was held in the Philippines from 5 - 10 September 2010. The training was sponsored by the Forest Management Bureau of Philippines and drew 33 participants from all regions of Philippines. These were forestry officers, community development officers, and natural resources officers facing natural resources-related management conflicts. The training was developed and conducted as part of the phased and mentored Training of Trainers (ToT) program on Conflict Management. This phase is meant to provide the ToT participants with an opportunity to apply what they learnt during the two weeks ToT program held in March 2010 in Bangkok. The training was conducted by the Philippines team consisting of Gwendolyn Bambalan and Janet Matires and were mentored by Antonia Engel (an International Consultant) and Fred Kafeero (FAO Forestry Department Staff). Mentoring was aimed at supporting the learning and development process of the individual trainers to enable them perform well in the in-country training. The mentors reviewed technical issues (participatory training techniques or conflict management) and broader organizational issues, including time management. Overall, positive observations were mainly on the good understanding of the technical content of the training, the interactions between the two trainers that enabled them to work and support each other very well. They also interacted well with participants, setting a friendly and engaging learning atmosphere. The mentoring programme needs to emphasize the importance of allocating adequate time for joint preparations by the trainers. This enables the development of a common understanding, especially about how each session contributes to reaching the overall training objectives. There is need to make 2-3 preparation meetings mandatory for the team. This enables a good exchange of information and sharing of material in the months preceding the training. Countries need to offer co-facilitation opportunities for motivated mentees/local trainers to further build their conflict management training capacity in the nfp context. Documentation of on-going conflict cases on forest management need to be supported in a systematic way to produce localized conflict management training materials and to generate information which can be used in the refinement and/or formulation of forest policies.